Welcome to the Ambassador condos in Panama City Beach! This clean Gulf front family resort supplies all the needs for a great vacation. Enjoy the community beachside pool, hot tub, tiki hut and private beach access. The area offers numerous activities such as deep sea fishing, parasailing, snorkeling, and shopping. There are several shops and restaurants within walking distance of Ambassador and Pier Park & Gulf World are also just a short distance. Enjoy a long day on the beach then head to one of the favorite local restaurants such as Sharky’s, The Back Porch and Firefly. Ambassador provides something for everyone and assures your vacation will be fun-filled and relaxing. 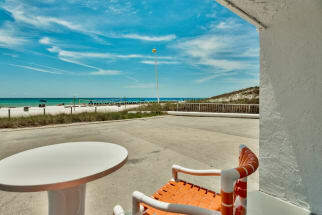 The Ambassador sits directly Gulf front on the white sandy beaches of the Emerald Coast. Enjoy an incredible view of the ocean from your condo's own private balcony every morning! The resort also offers a beach side pool, a hot tub and tiki hut. The Ambassador is walking distance to many incredible shops and dining and will be sure to make your next vacation as relaxing as possible. The best thing about the Ambassador condos on ECBYO is that you can book them directly with the owner or manager! Booking through Emerald Coast By Owner means you will be in direct contact with the owner the whole time. This will assure you are getting the best price for your vacation and the most reliable information. Feel free to use the Email Owner button or phone number on every listing!